Workplace messaging platform Slack has launched its first Australian campaign, two years after launching in Australia. The campaign, running throughout this month, will appear across various out-of-home channels and on in-flight entertainment services. 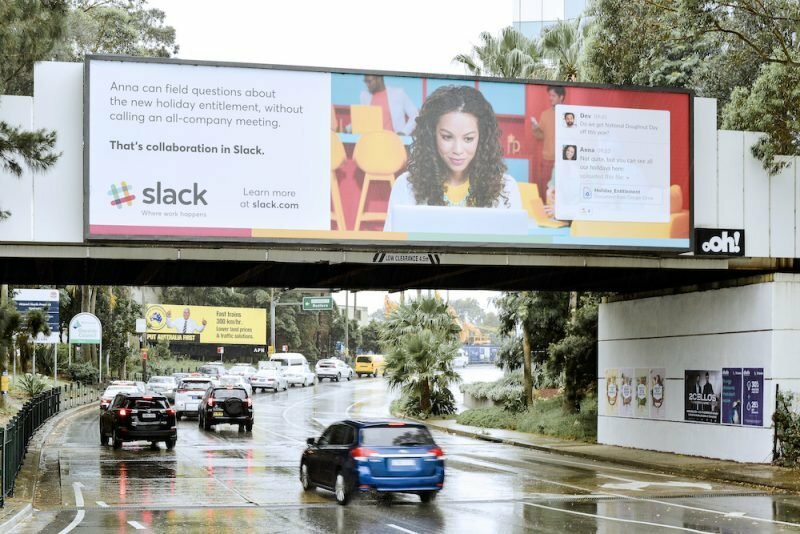 “Collaborate with Slack” features out-of-home advertising in office buildings on the eastern seaboard, large format roadside billboards and airport advertising in Sydney and Melbourne as well as on all Qantas domestic flights. The campaign will also appear in office lifts and lobbies across Sydney, Brisbane and Melbourne along with Qantas’ Club and Business lounges; or waiting for the lifts. The short videos launched as a part of the campaign will show how Slack enables collaboration and agile decision-making by bringing staff together through its ‘channels’. Kelly Watkins, VP of global marketing at Slack, said: “The way we work is changing, people want to move quickly, feel engaged at work and have the autonomy to make decisions, and that’s what Slack enables as the collaboration hub. “Our mission is to help people work together as easily online as they do in person by ensuring the right people are always in the loop and key information is always at your fingertips. This campaign aims to demonstrate what the future of work looks like. Too busy, doesn’t tell a story about the product, feels messy. Come on Slack! Do better! Hi I think that’s the worst outdoor ad I’ve ever seen. Love slack but that is bad. How can anyone possible read all of that while driving? TERRIBLE creative. Marketing $$ down the drain. almost as bad as dropbox pushing cloud collaboration for creatives in OOH. I think the campaign is very colourful and eye-catching. While it’s noisy, at least the ad stands out.